The Razor E200 Electric Scooter is a self-propelled version of the popular Razor kick scooter. Instead of having to get warn out getting to where you want to go, the electric motor does all the work. We found Amazon.com is offering a 22% discount on Razor E200 Electric Scooter. Click here to check it out. It features all high quality materials like; tubular steel frame and extra wide deck. 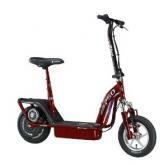 The electric motor and chain driven rear wheel are very quiet and 8” air filled tires combine for an ultra smooth ride. 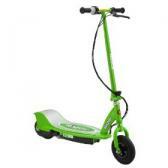 The handle bars extend up to a comfortable height and features twist actuated throttle and hand brake. 22% Off + Free Shipping on Amazon Now! 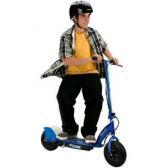 Razor does not just make one of the most popular kick scooters on the planet; they also make several models of self-propelled scooters so when your kids get older. Gone is worry about running out of kick power half way to their destination and they are stuck dragging it the rest of the way. The E200 electric scooter is just what they need to get them where they want to go. It is capable of speeds up to 12 mph depending on the weight of the rider. 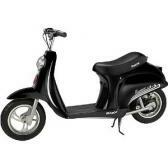 The scooter is made of all high quality materials including; tubular steel frame and extra wide deck for added stability. The deck doubles as a cover for the battery compartment and electric motor. The rear wheel is chain driven similar to a motor cycle and it delivers the power directly to wheel. It has extra large 8 inch air filled tires on the front and back for extra stability and comfort when the road is a little too rough. 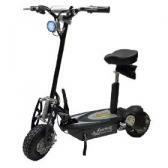 The handle bars extend upward to comfortable height and the hand brake and twist actuated throttle are mounted on the handlebars for ease of use. 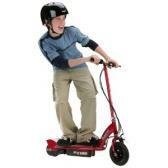 It has a weight capacity of 154 pounds and it is meant to be ridden by both children (over the age of 13) and adults. It is highly recommended that children under 18 years of age to wear a safety helmet and protective pads. During our research for the Razor E200 electric scooter we found that there were more than 212 consumer reviews posted online. From all of those reviews it received an average rating of 4.1 stars out of a possible 5.0 stars. Along with the high marks from the consumers came a majority very positive comments. Several of the reviewers really liked how well it was made, very sturdy and yet nimble enough for their kids to ride it. Click here to read more reviews. Other reviewers were impressed with how much pick up it had and that it was really easy to maneuver. It was very easy to get setup and after putting it on charge for about 12 hours it was ready to go. That was a huge deal according to many of the reviewer. After we completed our research for the Razor E200 electric scooter we concluded that it was great product and based on the results from the consumer reviews the majority of the consumers agree. We would definitely recommend it. Click here to save $50 for a limited time only! How would you rate the "Razor E200 Electric Scooter"?